Introducing another roasted squash recipe for you to explore. I really want to spread the "squash-love" this fall because they are so delicious & easy to make and often overlooked because you may not know what to do with them. A couple weeks ago, I did honey-roasted kabocha with ginger-lime creme-fraiche and it has seriously become one of my all-time favorite things to eat. This time, it is the delicata squash. Here is a visual...it looks like a fat, yellow zucchini and it is so easy to work with. The skin is edible and the flavor is mild and so yummy & sweet when you get them nice and browned in the oven. I've served them twice recently to people unfamiliar with this veggie and both times, everyone was raving. You really just slice 'em up & roast them and you can't go wrong. Both this and the kabocha recipe would be easy & amazing sides for your Thanksgiving feast. The pepitas and pomegranate add a nice crunch & pretty pop of color to the creamy delicata...it's seasonal & festive and completely vegan if you or any of your guests roll that way. Preheat oven to 350. Place pepitas on a rimmed baking sheet. Roast for 10 minutes. Remove from oven and set aside. Turn oven temperature up to 450. Cut delicata squash in half lengthwise and scrape seeds to remove. Slice each half crosswise into 1/2 thick crescent-shaped pieces. Toss with 2 T. rosemary, oregano, kosher salt & pepper. Place on a rimmed baking sheet in a single layer and put in the oven. Roast squash for 20 minutes. While roasting, toss Anaheim peppers with 2 t. olive oil & 1/4 t. kosher salt and place on another rimmed baking sheet. When squash has roasted 20 minutes, flip pieces so they will brown evenly on both sides and return to oven. Place the baking sheet with the peppers in the oven at this time as well. Roast squash & peppers 20 minutes, stirring peppers once. Remove the pan with the squash, sprinkle the chopped garlic over them and stir. Return to oven for 4 more minutes to cook garlic. Remove squash & peppers from the oven - the squash should be nicely browned on both sides and the peppers soft & slightly browned. 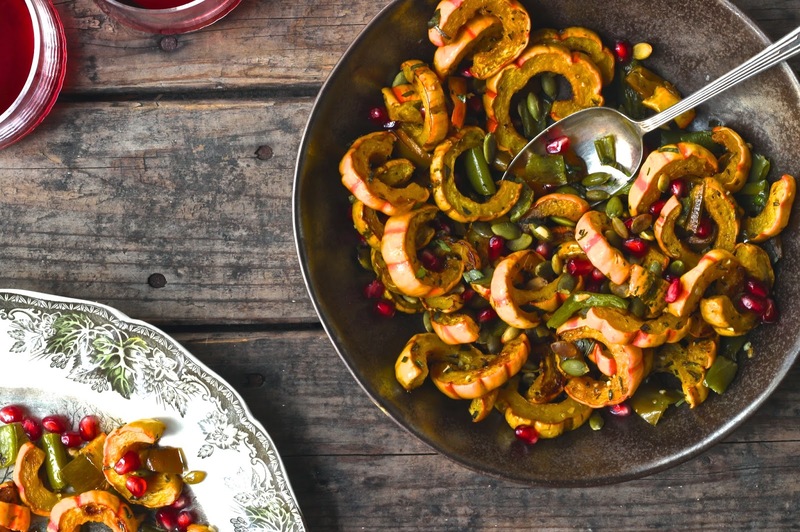 Toss together with basil & pepitas and sprinkle with pomegranate arils to serve. Season with more salt & pepper if necessary.